What Gives when your plate is full? I realized my blog was what I could let go of as I became immersed in the down to the wire prep for our church 300th anniversary. This was no ordinary event but a historic research, writing, musical, timing, editing, and scripting and performance to encompass the church history for 300 years in one hour. I did it! To say it possessed my whole mind and took over for awhile is an understatement, but well worth every ounce I put in that effort. The morning began with the bass viol playing soft music of welcome, our guest bassist Scott Chaurette of the Hartford Symphony. The chimes rang, we started on time. The opening prelude by Organist Erik Haeger was on Harpsichord, the narrator Mark Phelps welcomed everyone to the year 1710. Through the first readings our mission to hold together a small village in the colonial wilderness became apparent and our striving for freedom and justice. The door burst open and a soldier (played by re-enactor member Stuart Lillie), of the colonial militia burst in to call the 93 volunteers to march for Bunker Hill. It was only minutes and we were moving into the next century. The Civil War on the dark horizon. The bass played haunting music the single sound emanating as the chords of Battle Hymn of the Republic floated into the sanctuary. Second time through the congregation joins in with the organ as well. Then on the third time the trumpets from up in the loft and the organ swells the pipes giving 300 years of celebration to the tune, it was huge. 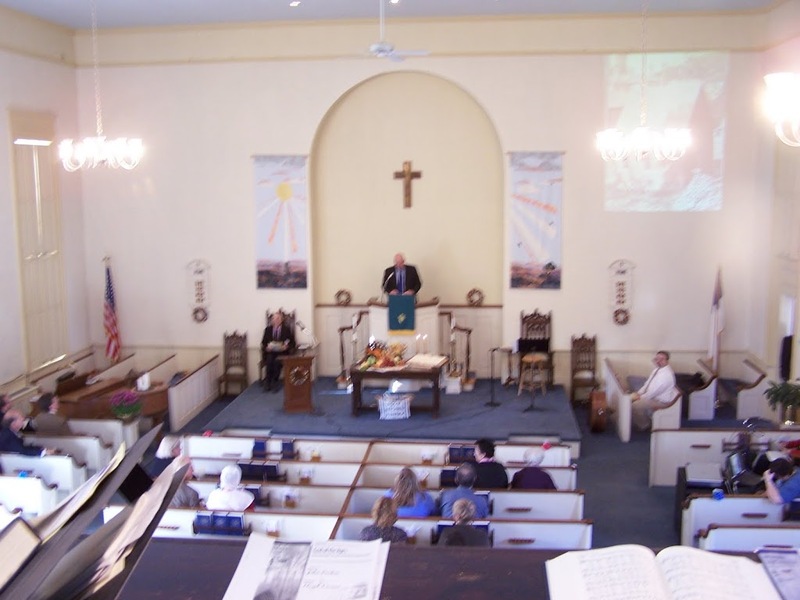 I tell the congregation how in the mid 1800’s the only music in the church was provided by ancestor Capt. Shepherd Stearns on bass and after the war by his son Jared Stearns. Jared’s picture is on the sanctuary wall, a media display timed to meet every song and reading. That media display meant hours of work first going through the archives and historical society files and then by Deb Hubbell as she assembled and timed the power point to match the script and musical timing I gave her with notes for where each image goes. It was very powerful. More music, more readings, time was slipping by and the centuries fell away. We heard from the Grace Notes our chime choir and about the 3 different buildings that served our congregation. The choir rose and opened with the celebratory notes of trumpets. The music of God of the Ages lifted First Church music to a new standard. It was an immense sound of celebration with full organ, 18 powerful voices and 2 trumpets. I had asked music director Michael Sylvestri to find me music that would raise the rafters, he did that perfectly! The offeratory music and prayer by the Rev. Joe Blotz brought us into the home stretch. The Mayor of Mansfield, Betsy Patterson, joining us to read a Proclamation and then one of the Deacons, Steve Lane to read a Proclamation sent by the Honorable M. Jodi Rell, Governor of Connecticut. I did the closing piece, a summary of our vision. How the 300 years of work and worship brought us to the place we are now , Open and Affirming, Just Peace and Green Church as designated by the United Church of Christ. We are a church of Faith in Action. Everyone shared a gesture of Peace and we adjourned to a cake reception in our newly refurbished fellowship hall. 300 years covered in one hour, a singular task of commemoration in a year long celebration of this milestone. So many more people were involved, it took a huge force to bring my vision of this service into a reality. I am incredibly thankful to each and every person. Especially my co-chair Jo-Ann Wade-Wunschel and to Rev. Matt McCaffrey who were so supportive.